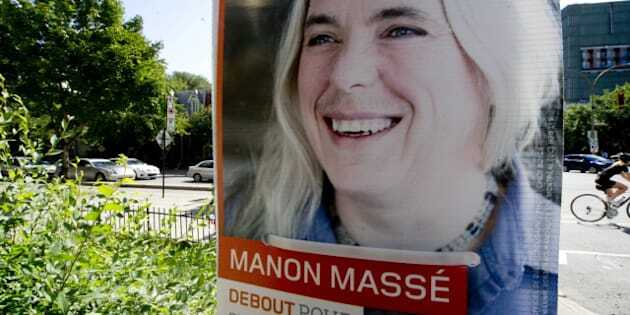 MONTREAL - Wrinkles, stray grey hairs and whiskers above a woman's upper lip aren't usually seen on campaign posters whose subjects are more than often made-up, coiffed and photo-shopped to cinematic perfection. But Manon Masse and others in her party are taking a different approach. The Quebec solidaire candidate wears a jean shirt in her poster photo and her hair is undone, loose strands roaming freely. Then there's the facial hair, visible above her lips. The picture has drawn a hail of insults and one-liners on social media sites. The community activist and mother of two, Masse says she wears her moustache proudly as a statement against "transphobia" — a fear of people who transgress traditional gender norms. "We are politicians who are very different," said Masse, 49. "We're not here to fit into heterosexual norms." For the last 30 years Masse has fought for the rights of women, immigrants and members of the LGBT community. Last year she was aboard the Canadian ship carrying medical supplies to Gaza that tried and failed to break an Israeli blockade. She is among the founding members of Quebec solidaire, which has feminism at the helm of its basic guiding principles. The party's commitment to gender parity is so great that it has more leaders — two — than it has members in the legislature. It refers to its female and male co-leaders as "co-spokespeople." One of them, Francoise David, was inducted into l'Ordre national du Quebec — the province's equivalent of the Order of Canada — for her decades of work fighting poverty and violence against women. The other, physician Amir Khadir, is the party's only elected member. The party touts itself as the only major one in Quebec to have acheived gender equality, with 62 male and 62 female candidates each running in the current election campaign. Quebec solidaire also stands out because of its political marketing. Its posters feature candidates dressed in plain clothes, they aren't airbrushed, and the candidates are peering to the left or right as if they were snapped candidly with a cellphone camera. One marketing executive says this is Quebec solidaire's way of proving its authenticity. He calls it fitting for a left-leaning party that promises to do things differently, in a broader climate of voter disgust over corruption. "Good advertising always comes from a real place," said David Rollert, vice-president of strategy and design for Pheromone, a digital marketing agency in Montreal. "If your message isn't consistent with your reality, it won't work." Ironically, Rollert says, this type of homemade-looking advertising probably took the most care and was most expensive to create — even more than those studio photos used by other parties. He calls it a welcome change from the traditional candidate photos. "They're so airbrushed they almost look embalmed," said Rollert. Isabelle Perras, vice-president for the public relations firm Citizen Optimum, says Quebec solidaire's stripped-down strategy is particularly attractive to youth. "It shows they are regular people, not just bankers or lawyers, (but) fighting for the people in the streets and government," said Perras. "This is a very left-wing image not even the NDP used in their last campaign." One Quebec solidaire candidate in Montreal's east end is hoping his party can bank on support from striking students and experience some of the luck the New Democratic Party had in the last federal election when it jumped from holding one seat to nearly 60 in Quebec. "Maybe we won't get an orange wave, but we're hoping for at least a strong current," said Alexandre Leduc, a candidate in Hochelaga-Maisonneuve. The marketing experts find the party's slogan — "Debout," which translates roughly as "Stand Up" — more arresting than its competitors. But will the original marketing campaign translate into new votes? Neither Perras nor Rollert is quite convinced. "It's a little in your face," said Perras. Added Rollert: "The purpose of a campaign is to win as many seats as possible. Whether this is the right strategy, I couldn't tell you."